Here we go again! Twenty-four of the remaining seeds in Granny’s glass container went into a water bath last night and I carefully removed them and dried them on a paper towel today. Twenty-four soil-filled cells were labeled and prepared for the tiny treasures and they are now tucked into the “birthing chamber” to await germination. Perhaps it is my imagination, but I honestly think there is a surging force inside these seeds that I can feel when I touch them. After soaking, the seeds seem to swell with a living, breathing drive and I fervently hope they will germinate and live to produce their own fruit. I can’t wait to see what fruit produces on these plants, if I should be so fortunate to be able to grow my Granny’s tomatoes. Seed potatoes have been delivered to our home and I can’t wait to cut them into planting chunks and place them in prepared rows. Heart & Sole Gardens has produced twenty different varieties of potatoes during the past several years, but this year, we will only grow our favorite six types. Purple Vikings are a favorite because they have a beautiful mottled pink and purple skin, white flesh and creamy texture that makes them a perfect choice for baking or mashing. Red Thumbs are a pink-fleshed, red-skinned fingerling variety that produces abundantly and is beautiful when included in a potato salad. Mountain Rose potatoes are a deep-red-skinned, red-fleshed type that are delicious roasted. French fingerlings are an early fingerling that has a pretty pink stripe inside and a rose-colored skin. 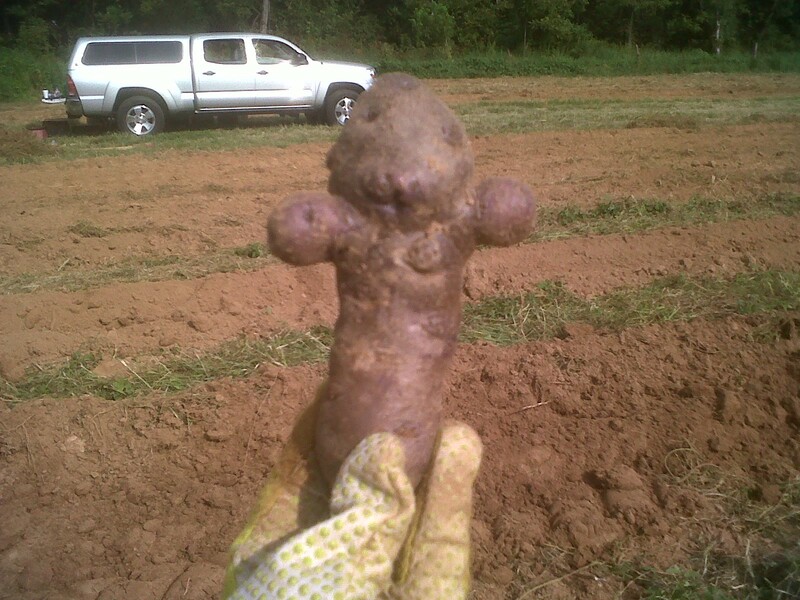 Purple Majesty potatoes have a deep purple skin and flesh and an earthy flavor. La Ratte fingerlings are a creamy potato with a light skin and flesh and are sublime in taste, whether roasted or mashed. As I celebrate my Granny’s seeds being placed in soil, I also anticipate the season’s planting schedule. Spring is just around the corner and I know physical work will be necessary, but I look forward to the soul-satisfying harvest to come. This entry was posted in Heirloom Seeds on February 23, 2013 by cindybarlowe. After this morning’s events, I had to post a sign! The twenty-four seeds I placed in Granny’s dish last night seemed to love their water bath. Early this morning, I touched a few of them and I could not believe how the life seemed to swell in their tiny shells. Some were still dry to the touch and cupped in a listless state, but others had that life force surge feeling I first noticed when I held Granny’s long-stored bean seeds. I dare to hope these tomatoes will germinate, thrive and produce fruit that will yield seeds to save for next year’s planting. Such is the life of a gardener: the life cycle is clarified and the end of one season means there is time to plan for the next. 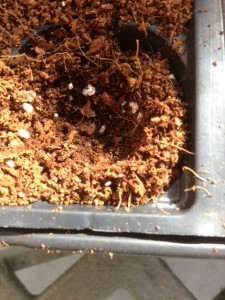 After a quick survey of the soaked seeds, I made coffee for Richard and me and mentally began planting. The seed cell tray was at the ready and, with a good sprinkle of water, hopefully, these babies would continue their living production. 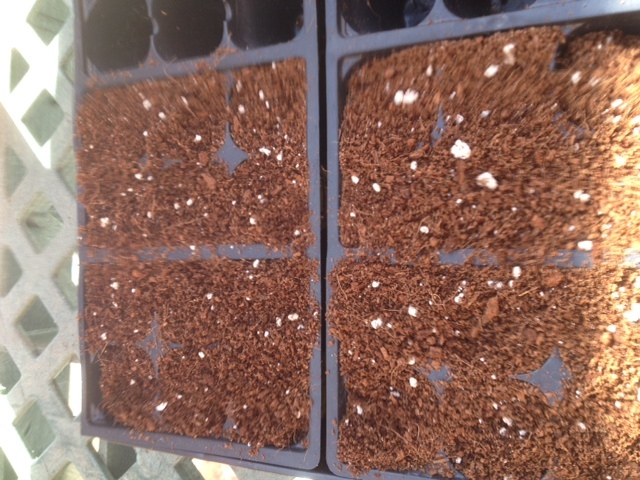 I spread a coffee filter to receive the soaked seeds, in order for them to dry before placing them in potting soil. That was when I noticed a problem. 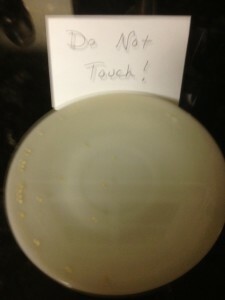 The dish holding the seeds had been moved, splashing the water inside across the granite countertop and scattering seeds. Panicked, I began to retrieve the seeds and slip them back into the bath. I counted. Seventeen. I found a few in the kitchen sink. Horrors! I shook the kitchen towel hanging between the sinks and found two more seeds. My final tally was twenty-two, which meant two seeds were lost. Probably washed down the sink. Since I had not shared my “soaking bath” plan with Richard, he did not understand my frantic search for escaped seeds and I berated myself for not placing the dish in a safer location. I quickly removed the soaked seeds from the bath and put them on the coffee filter to dry. After a few hours, they were ready to transfer to their new home. 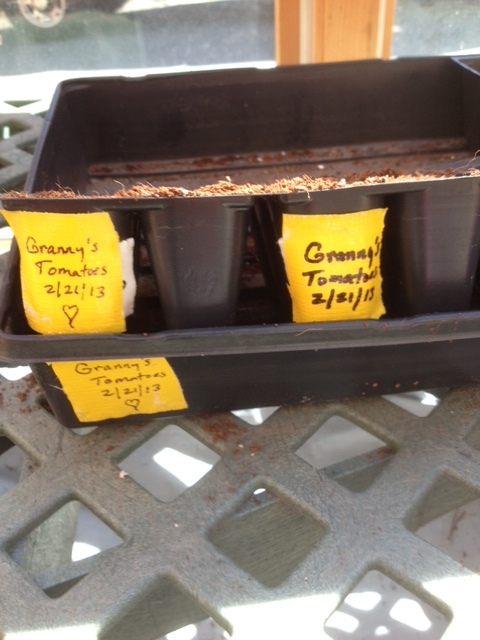 Trays labeled for Granny’s seeds. After trying several labeling methods, I find that duct tape is perfect for attaching to plastic trays. I also use it on tomato cages and garden stakes. I use a permanent Sharpie marker to write on the tape (I prefer Shurtape, manufactured right here in NC!) and the label will withstand the elemental forces of nature for an entire season. Using my pinkie fingernail, I carefully picked up each seed and placed it in a cell, filled with potting soil and indented to receive the seed. Using my pinkie fingernail, I carefully lift each seed to move to the potting tray cells. Since I prepared twenty-four cells for planting and only had twenty-two seeds, I decided to take two more from the precious bottle stored in my freezer. I marked the two cells housing these babies with a duct tape “x” and covered all the seeds. I gave the entire bunch a good drink and then sprayed them with a light coating of fresh water. I prefer to use rain water with seedlings, but had to resort to tap water today, since I did not have stored rain water at the ready. 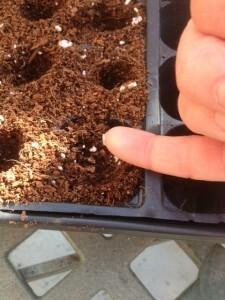 A tiny tomato seed waits to be covered with potting soil. 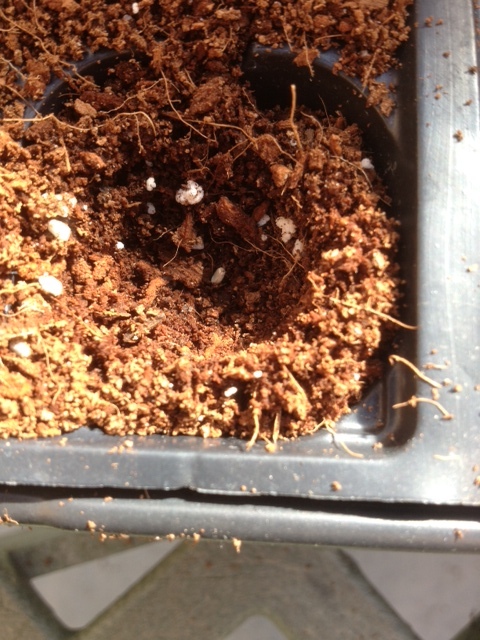 “x” marks the cells where seeds are planted that have not been soaked. As I do with any of my grandmothers’ seeds, I prayed as I planted them today. I asked for blessings upon these tiny seeds and help to make them germinate, thrive and produce beautiful fruit. I asked for guidance in my work and expressed gratitude for those who saved these seeds. As I placed the plastic covering on the tray, I decided to take advantage of bright sunshine and placed the covered tray on a picnic table on my southern-exposed deck. After a few hours, I moved the tray to my “birthing chamber” rolling cart and turned on the grow lights. 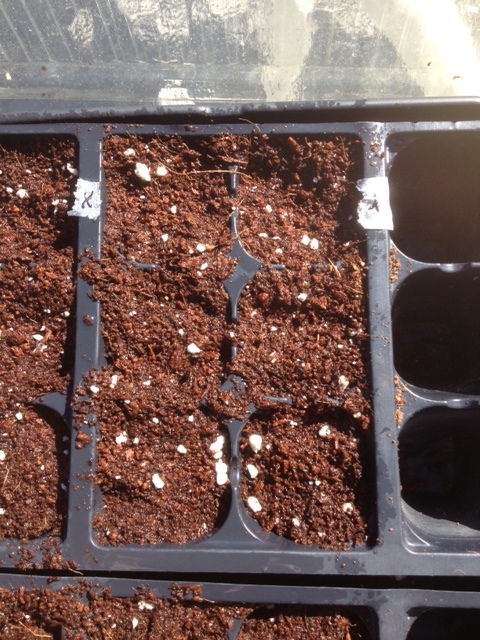 Twenty-four seeds are ready for the next step in their life cycle: germination. Twenty-four more seeds are soaking in tonight’s bath. 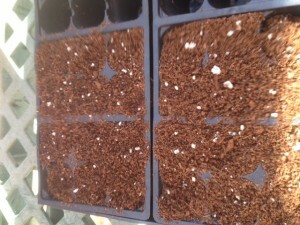 Tomorrow morning, I will prepare them for planting and can’t wait to feel that life force surge in their tiny pods. This entry was posted in Heirloom Seeds on February 22, 2013 by cindybarlowe. Twenty-four tiny tomato seeds soaking in Granny’s dish. Tomorrow is a BIG DAY! Twenty-four of the three hundred and four heirloom tomato seeds I “inherited” from my grandmother will be put in potting soil. I cleaned a tray and added organic potting mix, combined with some of my own compost, and am eagerly anticipating tucking these tiny babies into the “birthing chamber,” my metal rolling cart with the garment bag-like plastic covering that houses a couple of grow lights. Since these tomato seeds are about thirty years old, I want to give them every possible opportunity to grow, so after consulting people I regard as “expert” seed starters, several online sources and a stack of print resources, I decided to soak the first batch of seeds. Soaking seeds before planting can “trick” the seed into thinking it has been in soil longer than it actually has, so germination is a few days faster for seeds that have been soaked. 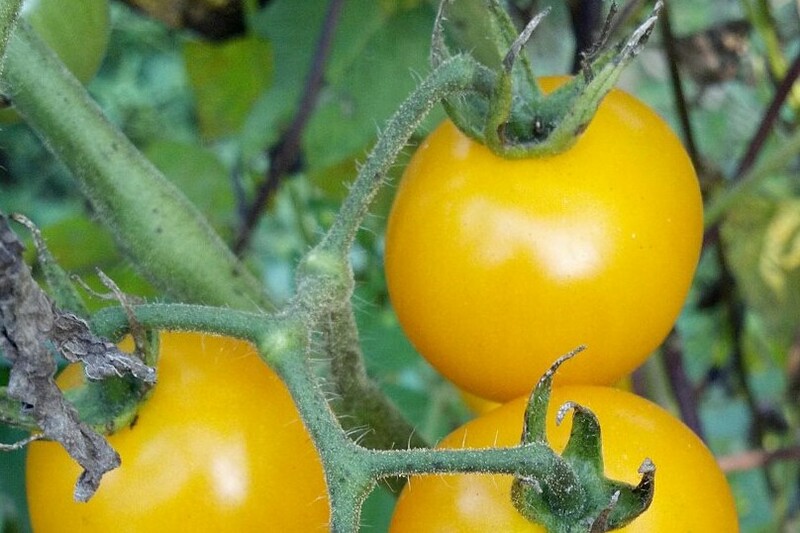 Too much time in the water, however, can cause the seeds to sprout and, for tomato seeds, this is undesirable, since tomato seedlings need air to breathe and soil provides a better growing environment than water, where the newly emerging plants can drown. I remembered a small glass dish I found in Granny’s antique dresser, so I pulled that out and washed it. 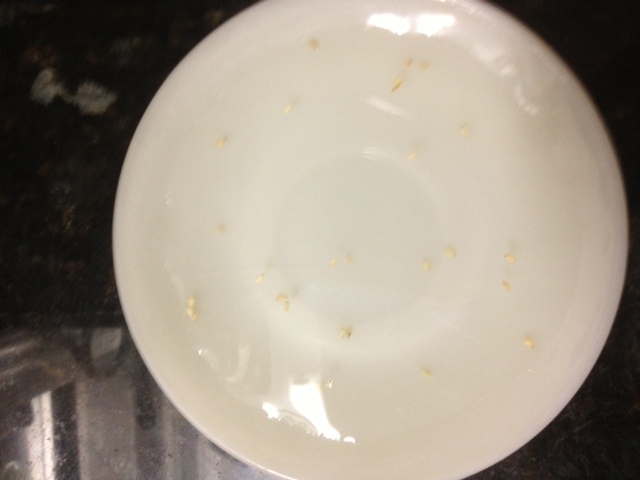 After carefully filling the dish with warm (not hot) water, I counted twenty-four of the precious seeds and added them to the dish. When I swirled the water, some of the seeds immediately sank to the bottom and I take this as a good sign. 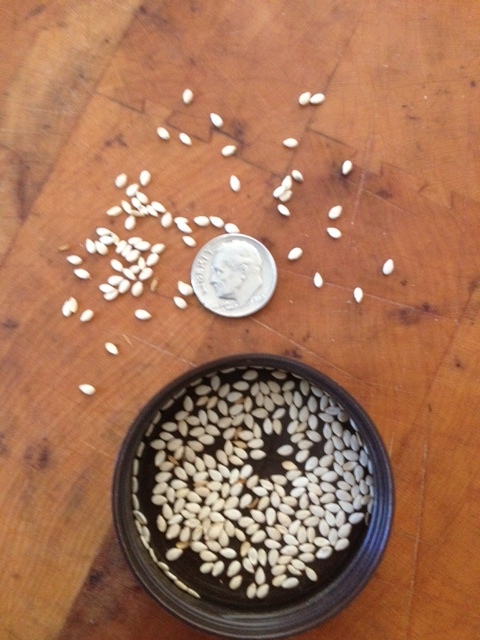 When saving seeds from mature plants, I put seeds in large glass jars, filled with water; the seeds that sink are usually viable; ones that float will not germinate. Perhaps this is not an indication of “live” seeds, but I hope it is. I also spent some time today planning where spring crops will be planted. Richard and I practice crop rotation and, with our seed potato shipment due to arrive any day, spring planting will soon begin in earnest. Last year, we planted four hundred tomato plants and realized we overextended ourselves, so this year, we promise we will have only as many plants as we have cages to contain them. I have promised Granny’s tomato seeds special “homes” at the farm, if they will only thrive. Please, join me in encouraging them to do so! This is part of one day’s harvest from Heart & Sole Gardens in August, 2012. This entry was posted in Heirloom Seeds on February 21, 2013 by cindybarlowe. 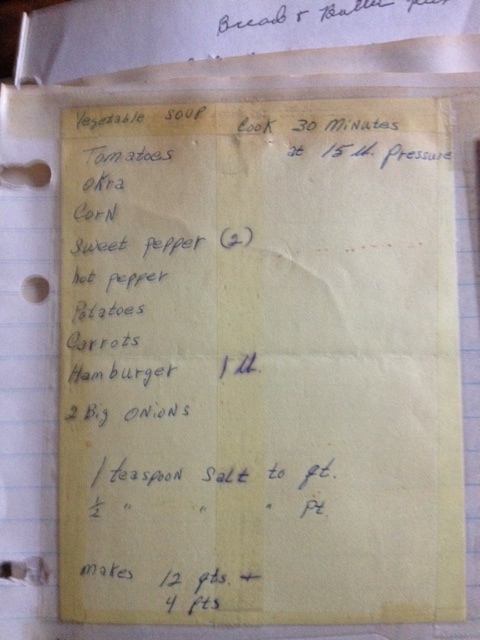 Granny’s handwritten recipe for homemade vegetable soup. When I took this photo, I could actually smell the soup cooking . . .
Two weeks ago, I went to sleep thinking about my grandmother, Lora Bolick Minton. Earlier that evening, I had explored the wonderful notebook of collected recipes Granny gave me before she died, in 1986. Many of the recipes, some in her handwriting, listed fresh tomatoes as an ingredient. Why, I wondered, when I have so many seeds saved by Granny, were there no tomatoes? One of my earliest memories is seeing a huge galvanized tub full of Granny’s colorful tomatoes, bobbing in the water she used to wash them before taking them into her kitchen. Around 3:00 a.m., I woke from a deep sleep with a thought in my mind: Granny’s tomato seeds are in the old dresser. Fully awake, I thought about the old dresser, an oak piece that, while solid, has a scarred original finish, missing drawer pulls and occupies a space in my garage. The dresser belonged to my great-grandmother and, at Granny’s home, was stuck in a back bedroom, where it held a variety of items. When Granny died, Richard and I moved the dresser to our house, which was under construction. We placed it in our garage, with good intentions to restore and use it in our home. Life became busy; with two kids to raise, jobs to do and plenty of home projects, we just never got around to doing anything with the dresser. For twenty-seven years, the dresser has occupied a corner in our garage and still holds many of the items Granny placed in it. As I opened the bottom drawer, my heart sank. The drawer was completely empty. I must have cleaned it at some point. Working from the bottom up, I slid the second drawer out. Stacks of greeting cards, some linens adorned with Granny’s handiwork and a couple of chipped plates were in this one. When I opened one of the top drawers, I almost cried when I saw small glass and plastic jars and medicine bottles full of Granny’s saved seeds. In a small jar that once held supermarket dried basil, I found tomato seeds. Are they the same variety? Several kinds? Far too old to germinate? Did I “kill” them by leaving them in a garage where seasonal temperatures can be extreme? Why were they even still in my home? Surely, I would have thrown them away, if I had cleaned the dresser years ago. While sleeping, did Granny whisper to me and direct me to find these treasures? Many questions surround these seeds. I invite you to journey with me as I attempt to find some answers. There are 304 tomato seeds in the container. According to the lunar calendar, February 21st and 22nd will be good days to start seeds and I plan to do everything in my power to encourage these tiny treasures to germinate. Since the “signs” for February 27th and 28th are in Libra, I also plan to plant seeds those days. Granny and I share a birthday and Libra is our Astrological birth sign. It can’t hurt, right? 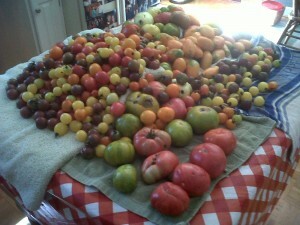 Three hundred and four tiny possibilities to continue the life cycle of these heirloom tomatoes. This entry was posted in Heirloom Seeds on February 19, 2013 by cindybarlowe.